Beautiful Incentives: Teespring review- Make or raise money from your art. Teespring review- Make or raise money from your art. This article is sponsored by Teespring. All opinions are 100% my own. Want an easy way to make money with your personal art? Have you been saving designs and never really did anything with them? Do you have a band that you want to get noticed? Then Teespring is for you. Put your own unique design on a Tee shirt and receive a high quality customized print. Then, sit back and see what bites you get from your audience. You can conveniently sell through Facebook, Twitter and other social media sites to get the most exposure of your creativity. I picked a random image to screen cap an example of how you start your t-shirt, show the cost and information that is needed. 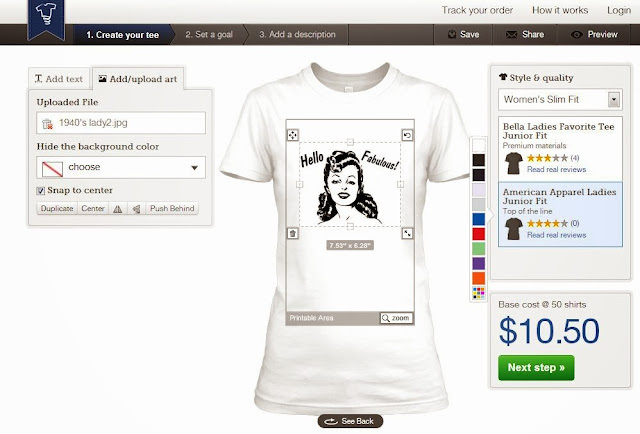 You can use your own high quality images or theirs and prices depend on the type of t-shirt you want. It's simple and fun! Teespring isn't just for the creator to make money for themselves. It's also an excellent tool to raise money for your favorite charity. You can get creative and raise money for your own charity too. One couple made a design for their adoption! You can see that here. Start up fees for getting shirts printed can be so expensive and you have to risk the quality you are going to get. With Teespring, there are no start up fees and they guarantee great quality. You get paid directly and don't have to worry about extra fees or how much your cut will be. You also don't have to worry about how many you'll need to buy or what sizes or colors to invest in, because your audience determines that. No need to buy in bulk! Your audience pays for everything when they buy the t-shirts. This is the crowd funding concept of Teespring. With breast cancer awareness fast approaching, It would be the perfect time to bring on your creativity for a foundation or charity of your choice!